Back in the early 1960’s when my late wife and I first began employment and building a potential nest egg for our future, we were shocked to discover how much the government was deducting from our paychecks each week for Social Security. We were not earning much in those days. I remember that my first job paid something like seventy-five cents an hour. My wife, who slipped into a post where she was running a small hospital laboratory, was earning somewhat more. Our income was more than enough to cover our costs of living. Even then we calculated that if we could take the money deducted from our weekly paychecks for Social Security and invest it in personal low risk bonds promising a steady interest return we had the potential of becoming quite wealthy if we remained on the job for the next 40 years. I remember there was a rebellion among the hospital workers at that time. They wanted to withdraw from Social Security and create their own retirement plan. But the government refused to allow this to happen. We were forced to accept Social Security. In the long run I realized it was probably a good thing because once the children arrived we were usually short of cash and setting aside money to build a savings account was considered next to impossible. Other retirement plans like 401K and personal retirement accounts were invented over the years to back up our so-called nest-egg. Once we retired we were glad to have the Social Security checks each month to fall back on. We need to clarify the implication here. These payments aren’t part of a “benefit.” It was money we paid from our weekly earned income. While we were making our payments, our employers were matching them. The amount paid into our retirement amounted to 15 percent of our income before taxes. If we averaged a modest income of just $30,000 a year during our working life, we would have accumulated nearly $180,000 in Social Security. As it was, those meager early paychecks quickly grew as inflation swept the nation. Most of us earned far more than $30,000 a year. And those numbers doubled when both husbands and wives were on the job. The Social Security program was designed to grow into a large nest of cash to accommodate a nation of workers, wives, children and retired people and assure everyone some quality of life, no matter what their situation. 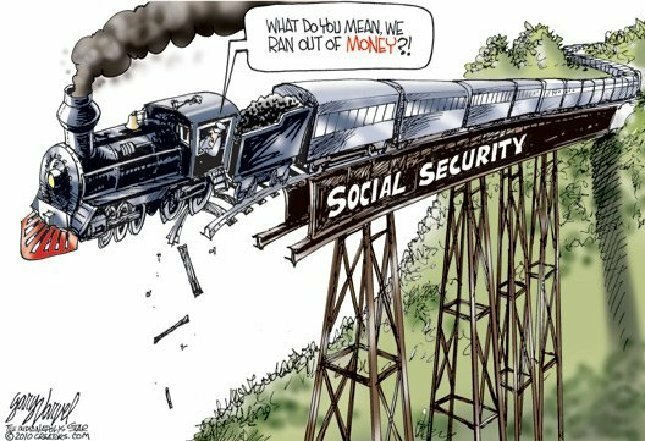 I recall a staff meeting at one of the newspapers I worked at where we were advised that in the beginning, it was calculated that most people would only draw Social Security checks for about a year or two after retiring at age 65. The average life span when Social Security began apparently was just 67 or 68 years. Now if my wife and I had been allowed to carry out our original plan to invest this money into a personal retirement account, with interest compounded at only one percent monthly, our nest egg could easily have climbed to well over a million dollars. That isn’t considered a lot in today’s market, but it is far better than the meager payments averaging $1,230 a month now received. If we had accumulated over a million dollars in retirement funds, and began withdrawing only three percent of that money per year, we would be receiving payments of over $3,000 a month. That is more than double what the government is paying. Do you get the sense here that the American workers have been ripped off by their trusted legislators? Indeed, if our government had only invested that money in low-risk, interest-earning accounts, our monthly checks would have been quite spectacular. Not only did they fail to invest the money, our legislators literally stole it. Dan Perrin, a Social Security advocate, reports that the money poured into Social Security over the years should have left a current balance of about $2.85 Trillion Dollars. But Congress appears to have spent it all. Most of the money went for war. They called it borrowing, but the money “borrowed” from Social Security has never been paid back. And now we are being told that because people are living longer, and because of inflation and a growing population, the Social Security system is running out of enough money to assure future workers a good retirement program. This, of course, is a lie. Don’t let them fool you. It is our money. We paid dearly for these programs, sometimes against our will. And now we want to get back what is rightfully ours. Never let them get away with calling those monthly payments a benefit.